The man was last seen on Tuesday. Members of the Oranmore Maree Coastal Research Unit. 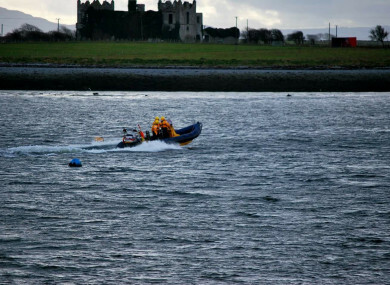 SEARCH TEAMS ARE are to continue looking for a man who was last seen entering the water on the outskirts of Galway city. The Oranmore Maree Coastal Search Unit said it will be conducting the search from Calasanctius College and is asking for volunteers to help. A spokesman said that the searches usually last two to three hours and that all help is appreciated. The man was last seen entering the River Corrib in the vicinity of the Quincentenary Bridge at about 9.30am on Tuesday 14 November. Gardaí are appealing for people to check in on housemates and friends, and are conducting house to house enquiries in the Snipe Lawn area. The missing man is described as being of average build and height, wearing a light windbreaker with dark tracksuit bottoms and a grey cap. Email “Searches to take place for man last seen entering the water in Galway”. Feedback on “Searches to take place for man last seen entering the water in Galway”.